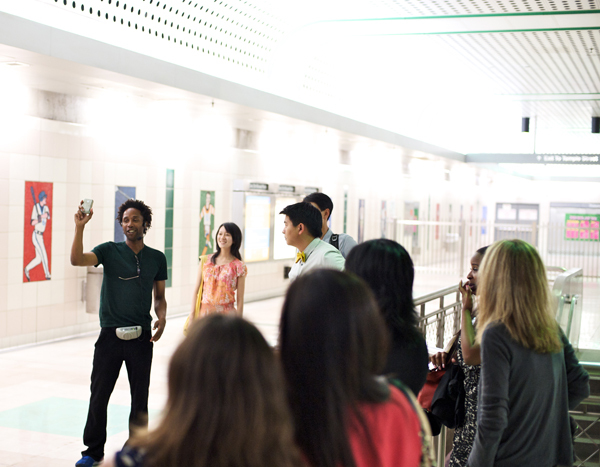 Metro continues its new series of free summer art tours, Metro Art Moves_DTLA, on Thursday, August 1. The tours pair local artists with docent guides, who share stories about the artworks and lead activities to heighten tour-goer engagement, demystifying the Metro system along the way. Meet promptly at 5:30 p.m. at the entrance to the 7th Street/Metro Center Station, at the northeast corner of Figueroa and 7th Street, on the street level. Tour has limited capacity. Space is available on a first-come, first-served basis. The tours will lead to Grand Park’s Out of Office event, including live music and food trucks. Want to grab a snack before Metro Art Moves_DTLA, or feeling a little hungry afterward? Show your TAP card and take advantage of special Metro Destination Discounts at locations near the tour route including Qdoba Mexican Grill, Tossed and Boba 7. Those who stick to ending their tour at Grand Park can use their TAP cards, provided on the tour, to score a free pair of sunglasses at the event information booth. Tour takes place on the first Thursday of August and September from 5:30 to 7:00 p.m.
Tours have limited capacity. Reservations are highly recommended. To RSVP, email lej@metro.net. Docent-guided tours are offered the first Saturday and Sunday of each month. Tours for groups of 15 or more are also available by special arrangement. For more information visit metro.net/art and click on Art Tours or call (213) 922-4ART. Is there still a chance that the station could be put at orange grove instead of fairfax. It would be awesome if LACMA and metro collaborated on the art for this station, even if it is put on fairfax and make this station have the best art of the whole system.